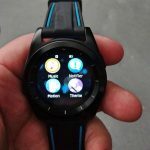 We’ve been fortunate enough to get some hands-on time with a few generic smartwatches, namely the No 1 G5 and No 1 D6. Both were decent, especially for their price. But No 1 has tons of other smartwatches, so you could say our work isn’t done yet. Queue the No 1 G6, the successor to the G5. It has a similar design, similar specs, and nearly identical features albeit with a few minor improvements. But is it better than the G5? Is it worth the money? More importantly, should you upgrade if you have an older model? We’re going to take a closer look, so read on. Like the G5, the G6 looks more like a traditional wristwatch. In fact, the display is the only giveaway it’s “smart”. If the screen is off, it’s just a black void and that will reveal it’s not a conventional timepiece. If the screen is on, you can clearly see what it is – an LCD display – and again that will reveal it’s a smartwatch. Why does it matter? 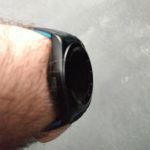 If you don’t want people to know it’s a smartwatch, those details are important. Personally, we like our smartwatches to look like an accessory we’d wear with our regular attire. For the most part, it does look like a regular watch. 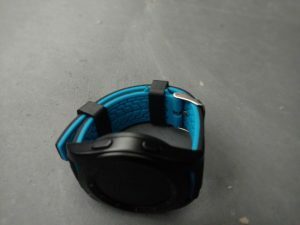 Our review unit was solid black with a bright blue and black band. There are other styles if you prefer something flashy. Also like the G5, it’s has a proprietary OS. It’s not a full or forked version of Android – like what the D6 has. That means the experience is nearly identical to the previous model. In fact, it looks almost exactly the same. In terms of software, nothing. There are a few minor hardware changes, however, in addition to a few similarities. Both have a 1.2-inch capacitive IPS touchscreen display, and a 240×240 operating resolution. Both also have a MediaTek 2502 processor, and a 380 mAh lithium rechargeable battery – though the G6 makes better use of it. 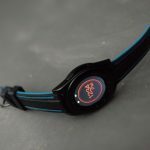 It also has a heart-rate monitor and pedometer that can track steps all the time – instead of just when you activate it. But even with a long list of features, there’s still one important question: Is it a good smartwatch or not? The No 1 G6 is reliable and the performance is decent. That’s important because you don’t want to stand around waiting for it to react to commands or to load an app. The G6 is surprisingly fluid and responsive. Plus, there are a ton of features packed into this little device. However, it’s not much different from its predecessor. We can’t see any reason to upgrade if you already have the older model. The G6 battery does seem to last longer, even though it has the same capacity. The G6 will last for a day or two, and that’s with a Bluetooth connection active most of the time. Sadly, the G6 isn’t waterproof. This is interesting since the is stainless steel. The main product page claims it’s “lifeproof” which is just a fancy term denoting sweat and rain. Another thing to note is that the band is extremely comfortable. They used a softer, “resin” material this time and it feels great against the skin. 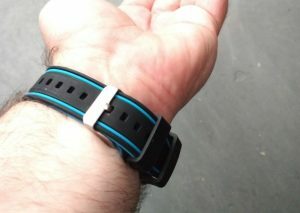 There is also a solid black band bundled in the box, so you can swap out bands if you want. The G6 seems durable. Even so, we don’t recommend smacking it with a hammer, but it should be fine for daily use. The display is a round IPS panel (1.2 inches). When the brightness is real low, it’s tough to see the display if it’s directly in the sun. But at a lower setting it’s just fine. There’s additional support for remote notifications, calls, music controls, fitness tracking and more. There is a heart-rate monitor on the rear, it’s not accurate but it works. All things considered, it’s reliable and that’s surprising for something of this caliber. Overall: 4/5 – The No 1 G6 is decent, reliable, and it works as advertised. The case is comprised of ‘316L’ stainless steel. Sadly, the G6 does not have a water-resistance rating – at least not truly. While wearing the watch, we did expose it to moisture such as rain and sweat but it was not splashed with water, nor was it submerged. The band is comfortable. In fact, it’s a lot more comfortable than the band that comes with the G5. The material is rubber-like, and the clasp is stainless steel. During our month with the watch, we didn’t notice anything problematic with either of these components. The G6 looks almost exactly like a cheap digital watch you might find in the cheap jewelry section of a retail store. 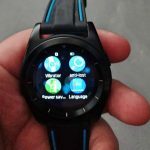 Obviously, the touchscreen and smartwatch features are what make it completely different from a conventional watch. 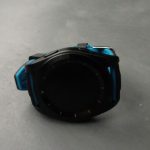 A ‘sapphire crystal’ material protects the display, and it has an ‘anti-reflective’ and ‘abrasion-resistant’ coating. It was good at preventing a glare from sunlight, and the review unit incurred no significant scuffs or scratches. There are two buttons on the right side of the device. They don’t appear flimsy, so it’s safe to assume they won’t break or stop working after extended use. You’d be surprised how many devices have this problem. On the left is a micro-USB port to charge the watch. In the box is a USB cable but there is no power adapter. If you want to charge it you have a couple options. You can either connect it to a computer, or you can use a charging adapter – so long as you have one with a USB port. Build: 3/5 – The G6 is not indestructible but it should hold up fine even with daily use. 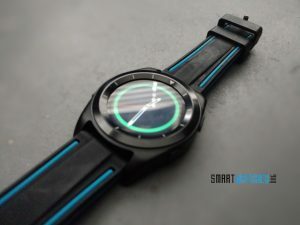 At a glance, the No 1 G6 looks like a conventional watch. It does have an accelerometer, which is used for an auto on feature. When enabled, the display can turn on by itself when you move your wrist. 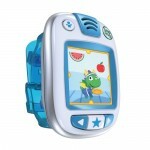 For an onlooker, this is an obvious indication it’s a smartwatch. In a dark setting – like a movie theater – it’s better to disable this feature. There are markers around the exterior bezel, but they are not labeled. The bezel cannot rotate either. There are two buttons on the right side, but there’s no crown. The button on the bottom will turn the screen on or off and returns you home. The top button is extra and can be configured in the mobile app to do whatever you want. Gestures and taps are used to navigate the interface. You can change screens by swiping from left to right, or you can swipe in the opposite direction to move backward one context menu. To select something, you simply tap on the screen. Interacting with the watch is straightforward. That’s both more important and more convenient than you’d think. But once you have experience with smartwatches, you’ll understand the novelty. 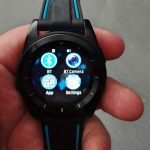 The No 1 G6 smartwatch is slightly better than its predecessor, but it’s not worth the upgrade if you already own one of the company’s other smartwatches. Design: 4/5 – The No 1 G6 smartwatch looks like a regular watch and it’s attractive. Before we dive in, it’s important to point out this is a smartwatch not a dedicated fitness tracker. Because of that, the stock apps are not designed to track your activity automatically. You have to open the pedometer app and start it manually. 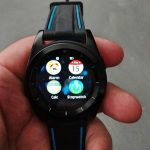 Luckily, because the watch is running Android 5.1, you can minimize the app after you start it and it will run in the background. But if you forget to start up the app, it’s your loss – nothing is recorded. 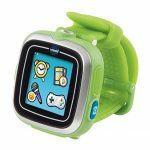 Once the pedometer or sleep tracker is activated, they will monitor activity until you stop them again. 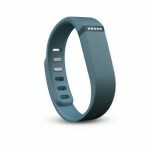 To check heart-rate – or beats per minute – you open the function, give it time to calculate, and it shows the result. You cannot record your heart-rate during a workout. It will only record your heart-rate while the app is open. You can use the mobile app to sync data your Android or iOS phone. There are separate apps for notifications and fitness tracking. So, multiple apps are necessary if you want to use all the features. It’s not convenient, but it works and that’s what matters. But this thing is running Android 5.1 so if you don’t like the stock apps, you don’t have to use them and that’s excellent. On our review unit we installed Runkeeper, Google Fit, and several others and they all worked great. This is especially great if you have a health insurance provider that lets you report personal fitness and activity habits. Humana, for example, awards points for reporting exercise. The points contribute to a grade, which can lower the cost of insurance premiums, and they can be cashed in for things like movie tickets. Your insurance provider may do things differently. Tracking: 3/5 – Everything you need is here. 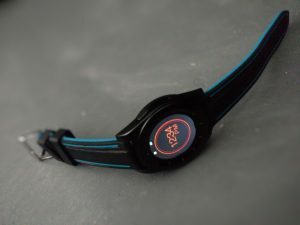 There’s also a heart-rate monitor, pedometer and sleep tracker. 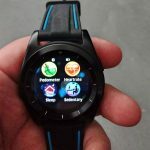 The No 1 G6 smartwatch does everything you’d expect a smartwatch to do, but more importantly it does most of it well. It can receive remote notifications and alerts from a connected phone. It can also receive calls, which you can participate in via the watch. You can either press bottom button to turn on the screen, or you can wiggle your wrist (if auto-on setting is enabled). The movement function isn’t always reliable. Sometimes the screen turns will turn on with barely any movement, but other times you have to wave your wrist around. When brightness is at the lowest setting, the screen is tough to read in the sun. If you turn the brightness up – which affects battery life – then it’s not bad. The main screen reveals the time, various notifications, and remaining battery life. If you swipe right or left you can move between menus. Each function is denoted by an icon. To open one, you can just tap on it. 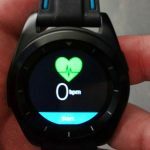 For the most part, the stock “apps” will stay open in the background with a few exceptions – like the heart-rate monitor. To sync back and forth from a phone you need multiple apps. One of them is for the Bluetooth link and syncs your calls and notifications. The other collects your fitness stats and spits them back out in pretty graphs and charts. We assume it’s like this so you don’t have to install both apps. The result is unnecessary clutter on your phone, however. There’s nothing special about the mobile apps, and the wording can seem silly. This is because it’s not always written in proper English. But, instead of using the recommended apps we opted to use the generic ‘Mediatek SmartDevice’ app. It’s compatible since the No 1 G6 has a Mediatek 2502 processor. The battery will last for a day or two, even if you keep Bluetooth active. 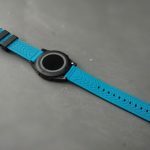 We found that it’s best to sync the watch with your phone every so often and rely on “smart” features – like notifications – only when you’re out and about. 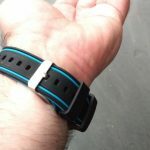 You can keep your phone in a pocket or bag, still receive notifications, but get reasonable battery life for the watch. When they arrive, notifications will display temporarily. After the screen shuts off, they are hidden away in a sub-menu that you’ll need to check for missed alerts. This is a welcome feature, because you don’t end up with a busy display full of unread notifications. When you want to see them, they’re only a swipe or two away. All missed notifications are stored under a separate menu until you dismiss them. With the mobile app, you can pick and choose what apps send alerts so you always have control. If you don’t want a particular app bothering you, then you can disable it. 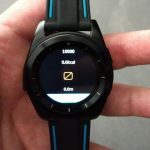 The watch will take calls and send them so long as you have a phone connected via Bluetooth. The G6 does have a mic and speaker, both of which are decent. We called several contacts during the review period, and all indicated they could hear us fine. You can browse contacts from the watch, but it must be connected to a phone first. It also allows you to sort through contacts, select one, and place a call. It’s simple, easy, and works. 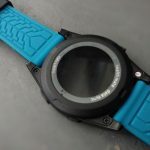 Functionality: 4/5 – The No 1 G6 smartwatch has a lot to offer in a cheap package! The No 1 G6 is compatible with most Android or iOS devices. If you have an iPhone (8.0+) or Android (4.3+) that supports Bluetooth 4.0, it should work fine. You can download the app for Android via Google Play, and the apps for iOS via the App store. There is also a QR barcode you can select in the watch settings, which will open download links in a browser if you scan it. We synced the watch with a 2015 Moto X with Android 6.0 (Verizon). 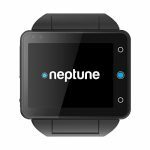 Compatibility: 3/5 – The No 1 G6 smartwatch is compatible with most iOS and Android phones. After our time with the G6, we are more than happy. It works as advertised, and even though there are some minor hiccups it’s certainly worth the price. You may notice that No 1 has a huge selection of watches, all with different styles. We can’t speak for all the models, but since we reviewed the No 1 G5 too, functionality seems to be par for the course. 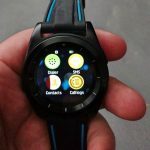 The G6 is cheap for a smartwatch, and it offers just as many features if not more than its competition. 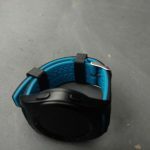 We hope you enjoyed our No 1 G6 smartwatch review and it proved useful in your search for the perfect wearable. Stay tuned for more coverage! 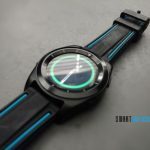 Where Can I Get the No 1 G6 Smartwatch? 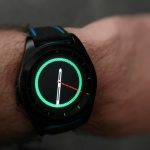 You can buy the No 1 G6 smartwatch from GeekBuying for around $50. That’s full price though, and they are always having sales. You will most likely be able to get it for 40% to 50% off. If you’d rather buy from a trusted seller on Amazon, below are some of the best listings. 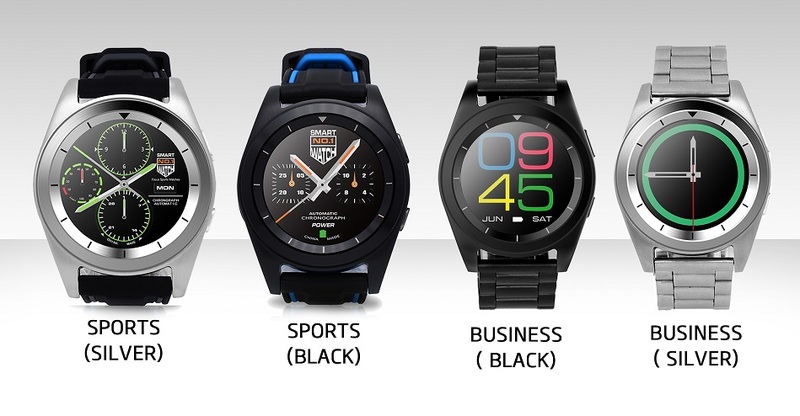 The watches listed are under another brand, but since they are generic they are the same models. Disclaimer: Geekbuying graciously provided the No 1 G6 for this review.